From 1st September autumn in England officially begins. 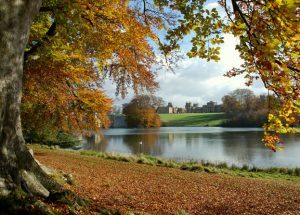 Dubbed the second spring the Treasure Houses of England would like to invite you to immerse yourself in russet tones and see spectacular autumn colours in the floral displays as well as cultivated and wild parkland. Where else than Beaulieu – meaning ‘beautiful place’ to admire autumn? Find peace and tranquility in the walled cloisters and herb garden. Take a tour of the Ornamental Kitchen Garden complete with 1870’s restored vine house. Walk hand-in-hand along the scenic Mill Pond walk and wander into the natural splendor of the Wilderness Garden. As autumn sets in at Blenheim Palace, 2000 acres of parkland will be transformed with an array of warm colours, making this a beautiful time of year to come and take in the stunning landscape and views. There are a wealth of events and activities to enjoy throughout the winter months; highlights include the Literary Festival and Sunday Jazz. Don’t miss the Burghley Flower Festival (4 – 12 October) an autumnal celebration which will transform Burghley’s State Rooms with floral displays created by local flower societies. Be inspired by the botanical theme ‘Cities on the Grand Tour’ arranged with the 17th Century art situated under opulent painted ceilings. Take a stroll through Ray Wood at Castle Howard and marvel in the season’s striking tones and resplendent autumn colour, from the many shrubs and trees, and huge array of ripened fruit and berries. Then make your way to the ornamental kitchen garden – Castle Howard Potager – for the autumn vegetable garden harvest. Having evolved over more than 450 years, the 105 acre Chatsworth garden continues to change today. There is plenty to discover at every turn, including the ninth installation of Beyond Limits, Sotheby’s annual exhibition of contemporary sculpture in the garden at Chatsworth from 8 September- 26 October. The Kitchen Garden is still producing good crops of plums, pears and apples to harvest, and at the beginning of September the Display House will have blooms on the passionflowers and water-lillies. There are over 100 acres of gardens at Harewood. They are full of variety, with plants from all over the world – all in the setting of a landscape created by Lancelot ‘Capability’ Brown. Harewood’s renowned Bird Garden is home to exotic species including penguins, owls, flamingos and parrots and the Himalayan Garden is an extraordinary world in miniature, a plant-hunter’s paradise. There’s also scarecrow trails around the grounds. Hatfield House forms the centre-piece of the largest private estate in Hertfordshire, with the woodlands covering an extensive spread across the county. Thus they offer a rich diversity of habitat and species. The woodland types range from the traditional coppice with standards, woodland and include commercial conifer broadleaved mixtures, continuous cover systems and minimum intervention woodlands. Stock up on garden essentials and a great array of plants at Holkham Hall’s Plant Fair (28-29 September). Or for a chance to see the spectacular arboretum with its many unusual and rare specimen trees resplendent in their autumn foliage, book onto one of the Autumn Tours of the Private Gardens (19 October). 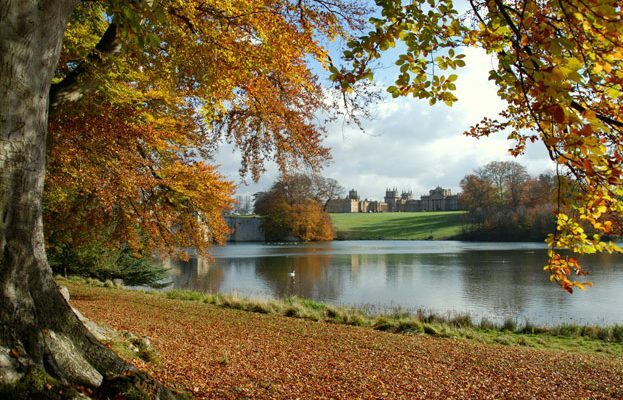 Set in 500 acres of picturesque parkland, Leeds Castle is the perfect setting for an autumn day out. Take a stroll through the Wood Garden, which follows the curve of the River Len to the Pavilion Lawn. Festival of Flowers: (23-28 September) See the castle’s State rooms transformed into works of art using flowers, by local florists, flower societies and clubs. Leeds Castle will also host its first Fantastic British Food Festival, (12-14 September) smell and taste goods from local food and drink producers, retailers, chefs and cookery schools. Woburn Abbey’s tranquil Abbey Gardens are open for everyone to enjoy the brilliance of Humphry Repton. Make your way through approximately 30 acres of serene formal and natural garden environments: from manicured lawns and colourful flower beds to peaceful woodland glades and ponds teeming with life. Discover the bog garden, a recent addition with it carnivorous plants, the romance of the Doric Temple which was carefully restored last year and watch the recreation work in progress on the rockery and grotto.